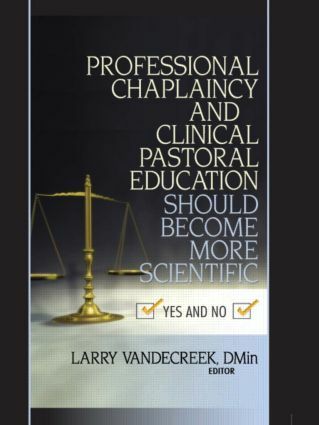 Professional Chaplaincy and Clinical Pastoral Education Should Become More Scientific: Yes and No examines the widespread ambivalence among pastoral caregivers and educators over the growing inclusion of science in pastoral care and counseling methodologies. Twenty-three seasoned professionals in the field give candid and sometimes emotional accounts of their interest inand reservations aboutthe role scientific research plays in their profession. Some authors look at the issue from a historical perspective; others voice additional concerns. A few make concrete proposals on how chaplaincy can become more scientific. The result is a unique insight into the relationship between the secular and the religious. Preface: What Has Jerusalem to Do with Athens? What Has Pastoral Care to Do with Science? Chaplain No: Should Clinical Pastoral Education and Professional Chaplaincy Become More Scientific in Response to Health Care Reform? Chaplain Yes: Should Clinical Pastoral Education and Professional Chaplaincy Become More Scientific in Response to Health Care Reform? Chaplaincy Is Becoming More Scientific. What’s the Problem?